Giacomo Meyerbeer (1791-1864) was born Jacob Meyer Beer in a covered wagon in which his mother was travelling from Berlin to Frankfurt, a presentiment of his travelling career. His early operas were written while living in Italy - hence his first name; and the years of success in which he wrote his masterpieces 'Robert le Diable', 'Les Huguenots', 'Le Prophète' and 'L'Africaine' were spent based in Paris but commuting between the European capitals. From 1830, for a century, these works were never out of the repertoires of the world's leading opera companies - even in Soviet Russia, where the libretto of 'Les Huguenots' was altered to present the fate of the Decembrist revolutionaries. Throughout the era of Grand Opera, Meyerbeer outshone Wagner, Rossini, even Verdi, at the world box office. His parents were amongst the wealthiest Jews in Berlin, close to the Prussian Court, and brought up their children in accordance with their status. Giacomo's father, Judah Herz Beer, sponsored an early attempt at a reform Jewish congregation; Giacomo's favourite brother Michael was a talented playwright and poet, and another brother, a keen amateur astronomer, produced the first maps of Mars. Meyerbeer identified himself as a Jew throughout his life, even commemorating family birthdays according to the Jewish calendar. There is no reason to doubt the sincerity of his pledge, given at the age of 20 to his mother on the occasion of the death of his grandfather: "Please accept a promise from me in his name that I will always live in the religion in which he died". Meyerbeer's success as an opera composer can be ascribed not only to his craftsmanship and melodic and colouristic invention, but to an unerring sense, shared by his favoured librettist Eugene Scribe, of giving the public what it wanted. This was coupled with a canny knack for management and publicity. He was undoubtedly and unashamedly a showman. Meyerbeer did make an early significant contribution to synagogue music: there exists in the Library of Congress in Washington the manuscript of a 'Hallelujah' which he set in 1815 for his friend and teacher Eduard Kley. Kley was the preacher for the proto-Reform congregation in Berlin supported by Meyerbeer's father, the wealthy contractor Judah Herz Beer, and he went on to become a leader of the Reform movement in Hamburg. The 'Hallelujah', for choir and organ, was written for Judah Herz Beer's synagogue (which was suppressed by the Prussian authorities in the 1820s) - and shows that the arguments about using an organ in the synagogue service have a solid ancestry! After that there is gap of some thirty years before Meyerbeer again addressed synagogue music. His return was at the request of a remarkable man, Samuel Naumbourg. Naumbourg who lived from 1815 to 1880, is together with Solomon Sulzer of Vienna and Louis Lewandowski of Berlin, one of the three 19th century giants who rescued, recorded, and expanded (by their own compositions) the Ashkenazic liturgical tradition. 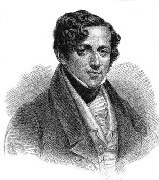 Naumbourg became the first chazan (cantor) of the Paris Jewish congregation in 1845, with the recommendation of the composer Halévy (whose own Grand Opera masterpiece, 'La Juive', had been produced in 1835, four years after Meyerbeer's 'Robert le Diable'). At the same time the French Ministry of Religion and Education commissioned Naumbourg to compile a definitive Jewish musical service, a task which he set to with gusto, and which resulted in the monumental 3-volume 'Zemirot Yisroel''. To achieve this Naumbourg invited a number of Jewish composers to make their own contributions to his work, including Halévy, Alkan and Meyerbeer himself. It is to this commission which we owe the setting of 'Uvenucho Yomar', the prayer with which the scroll (sefer) of the Torah is returned to the Ark. This is in fact an arrangement of an earlier children's (non-Jewish) prayer for three voices by the composer, (which has recently been recorded by Anne-Sofie von Otter). Although, according to the Meyerbeer authority Robert Letellier, Meyerbeer records meeting with Naumbourg to provide an item for 'Zemirot Yisroel', he provides no details in his papers of actually composing anything. It may be that the arrangement was in fact made by Naumbourg. Another piece in the 'Zemirot Yisroel' collection, by Naumbourg himself, poses an interesting problem. Naumbourg's own style was certainly Meyerbeerian; - and it's not surprising that a composer will be influenced by his immediate surroundings - after all, Sulzer's compositions sound Schubertian and Lewandowski's sound Mendelssohnian. Naumbourg's setting of the Morning Service prayer 'El Adon' is however more Meyerbeerian than most; its first few bars are in fact identical in melody and harmony with the beginning of the Grand March from Meyerbeer's 'Le Prophète'. Now 'Le Prophète' was premiered in Paris in 1849, although Meyerbeer had completed the score and deposited it with a Paris lawyer in 1840, holding off a first performance until he could obtain a production and cast that satisfied him. Volume 2 of 'Zemirot Yisroel', which contains 'El Adon' was published in the early 1850s; and to this setting Naumbourg attached an extraordinary footnote. “To refute any accusation of plagiarism”, it points out that this version of 'El Adon' was performed in the Paris synagogue “in 1844, that is, five years before the publication of Meyerbeer's 'Prophète'”. However this was still four years after Meyerbeer had completed the score. This little version of a 'locked room' mystery remains unsolved. Meyerbeer's religion emerged as a public issue when he became the chosen target of a powerful polemicist, Richard Wagner, whose vitriolic essay 'Jewry in Music' (1850) decries a supposedly Jewish 'commercial' approach to opera as against Wagner's own vision of Art. The personal attack on Meyerbeer, who gave Wagner his first big break by encouraging the production of the latter's 'Rienzi' in Dresden, who gave him financial aid, and to whom Wagner in his time of need had written more than one fawning letter, is vicious. Wagner's ingratitude in this squib seems at least as gross as his anti-Jewish crudities. Nonetheless Meyerbeer's letters and diaries make it clear that he was never under any illusions that his place in society was maintained in spite of, rather than in indifference to, his origins. Writing to his friend, the poet, (and unhappy convert to Christianity), Heine, in 1839, he opines "I believe that Jew-hatred is like love in the theatres and novels: no matter how often one encounters it in all shapes and sizes, it never misses its target if effectively wielded...... What can be done? No pomade or bear grease, not even baptism, can grow back the foreskin of which we were robbed on the eighth day of life; those who, on the ninth day, do not bleed to death from this operation shall continue to bleed an entire lifetime, even after death". In December 1863, he wrote out a personal prayer which, if not specifically Jewish, contains numerous echoes of the sentiments of Jewish liturgy : 'Beseech the eternal God that He keep us on the path of virtue, honour and justice.....ennoble and purify my heart and soul... '. (The same prayer also includes requests to 'Preserve my artistic creativity.......and ennoble my artistic fame', examples of the composer's shrewdness even in dealing with his Creator). At his death the next year he was buried according to orthodox rites in Berlin, after a great funeral procession in Paris and a special train for the coffin. All this, and the crowds of mourners, was reported throughout Europe as was only appropriate for the most successful and popular opera composer of the nineteenth century.